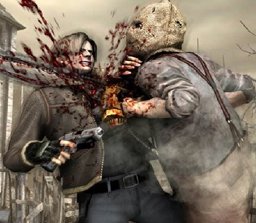 flashzombies.com - "Resident Evil 4"
You know those games that make you sit back and go “wow”? Those games that bring back those old feelings that you had when you were playing as a kid? The ones that bring a sort of newness and unpredictability that you thought had been long gone? Well Resident Evil 4 is one of those games. 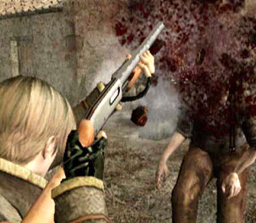 In RE4 you take the role of Leon Kennedy (of Resident Evil 2 fame) who’s now an Agent for the U.S. government. His mission is to travel to Europe to find out what happened to the President’s daughter. Where’s Umbrella? 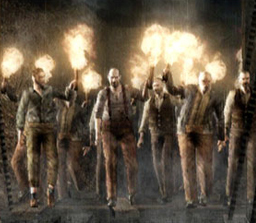 The government shut them down… blamed them for the Raccoon City accident that happened 6 years prior. A lot of things have changed; this is the new Resident Evil. Make no mistake this is Resident Evil, just a much need evolution of the survival horror genre. This game gives you plenty of ammo, action packed sequences and unlimited saves yet still manages to give you the creeps and the feeling of being overwhelmed. For example, in an early segment in the game you are held up in this house with a companion you met along the way. What are you hiding from? Insane villagers (sorry kids, no zombies!) out for your blood! You have to block the windows, knock down ladders and keep them from coming inside the house in a Night of the Living Dead way… Very intense. That’s the best word to sum up this game: Intense. Are there downsides to this game? I’m sure you can nitpick a few things like no quick switch for weapons, limited item storage, no storage box and the inability to strafe but those things are so minor that you don’t even care about them while playing. The positive far outweigh the negative (if you can even call it that). Resident Evil is back and it’s here to stay. 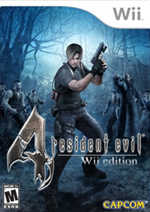 After a few missteps like Resident Evil: Apocalypse and the online debacle Resident Evil: Outbreak, RE4 has put the series back on the map and judging by RE4s ending, it’s not going anywhere anytime soon. What do you think of this game? 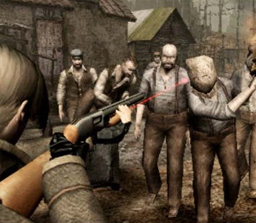 Click here to discuss Resident Evil 4 in our forum.